It was another busy day today, a follow-up to yesterday’s car-shopping. I took my sister back up to Ottawa so she could pick up the plates from her decommissioned car, and then dropped her off at her house before returning back to my parents’. The outing ate up most of the afternoon, and by the time I got back again it was already dark. However, I did take Raven for a hike before we left in the morning, so that hopefully she’d be tired enough for the afternoon she’d just spend it sleeping. My sister joined me, and the three of us hiked along the trails that circle the perimeter of the property. We walked back as far as the pond where I saw the Canada Geese last time I was here, now completely frozen in. The sub-freezing temperatures have persisted long enough that even the river is nearly completely frozen over now. There are also a few trails that cut through the middle of their woods, but we didn’t have time for everything. Not to mention that it hadn’t warmed up significantly since yesterday, and so we didn’t want to spend an extended period outdoors. Yesterday when we were out hiking about, I noticed Raven was shivering. I can’t say I blamed her, since I was wearing my thick down jacket and was still on the verge of shivering myself, wishing I owned a balaclava, or at least had remembered to bring a scarf with me. She’s got a thin coat for a dog (at least the dogs I’ve known), seeming to have the unfortunate combination of thin, soft border collie texture with the shortness of the lab. Unfortunate for our Canadian winters, anyway – I do like how soft she is to touch, though. There was a time that I would probably have rolled my eyes at a dog owner who bought their dog an overcoat, but now I’m one of the ranks. Raven seemed not the least bothered by it, romping about like usual, and I think it kept her warmer. She certainly looked cute. We saw a few interesting things while out. 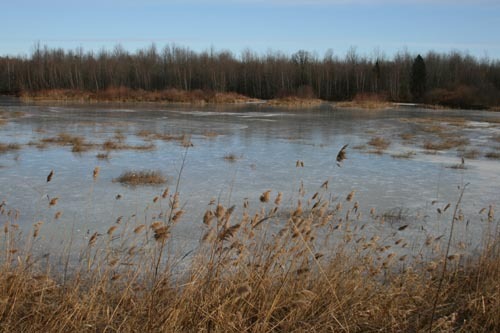 Everything is frozen now, there’s hardly a drop of water left liquid, and what there is is all running in the riverbed. 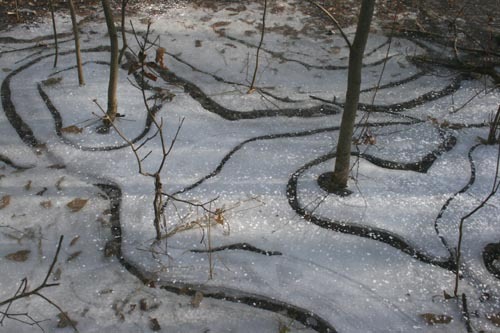 The vernal pools of the forest are full, and frozen. I’m not sure just what process creates these air-bubble patterns in the ice, but they were several layers down. You see this a lot in shallow puddles and such, where there’s a pocket of air under the ice. The little bit of searching I did suggests it may be the result of a warm or sunny day melting the top of the layer of ice or snow, and causing cracks in the rest, then a rapid freezing seals over the top of the surface again; the water that’s trapped between ice layers then seeps through the cracks in the lower layer (liquid water is heavier than ice), leaving an air pocket. But don’t quote me on that. My sister felt the pattern looked like a face, maybe sort of like The Scream if it had been painted by Dali. 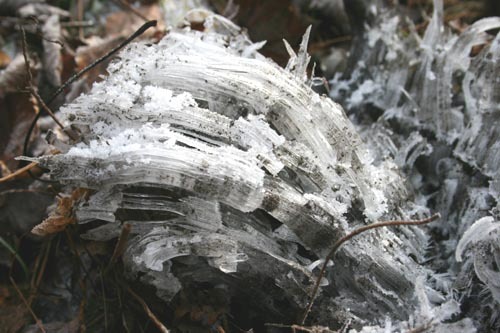 Speaking of weird ice formations, there were a lot of these along the trails. It was really hard to get a photo that I felt adequately captured the shapes, and in the end I still don’t think I really got it. They looked like ice-covered grass stems, except there was no grass inside. 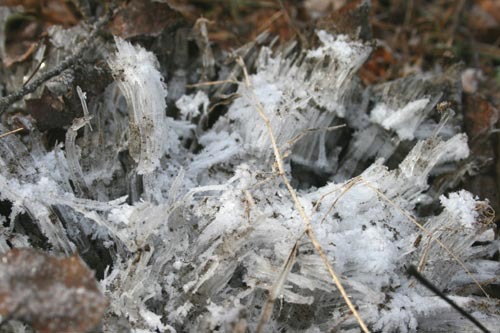 They seemed to be solid ice, but thin and often curved like grass stems. Strangely, they were covered in dirt. I wondered if perhaps they were formed by a process related to that which created my freezer icicles, maybe starting out with ice forming on the blades of grass, but wicking moisture up from the ground (they were all in low-lying areas that were wet or damp a few weeks ago when it was warmer) and extending the ice crystal formation beyond the end of the blade. The dirt maybe got drawn up with the water molecules? Carrying on with the theme of I’m-not-really-sure, I think this is Winterberry Holly, Ilex verticillata. My mom had commented to me that there were a couple of bushes with flaming-red berries in a wetland up the road, which she’d noticed on a recent trip to town, and she pointed them out to me as we drove by the last time I was up. 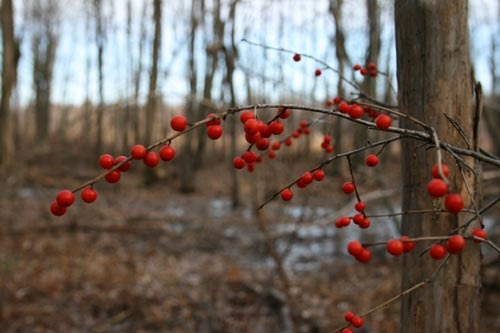 I did a search for Ontario shrubs bearing orange berries in the winter, and came up with Winterberry, but I would feel more comfortable calling this that in the summer, when I’ve seen its leaves. Even though I’m not sure there’s any other shrub that grows in our area which retains bright orange berries into the winter. Unless there’s something conclusively distinctive about a plant I tend not to make definitive IDs in the winter, and even then I usually have some summer experience with the species, too. To prove this point, Jennifer over at A Passion for Nature recently included a photo of snow-covered Winterberry in one of her posts, but her bush doesn’t look much like mine, so I’m inclined to just leave it as a tentative ID. 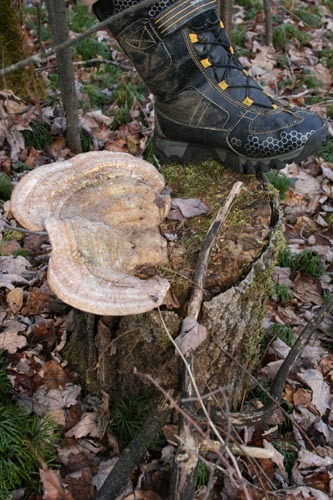 We discovered this giant bracket fungus growing from the top of a stump alongside the trail. I had my sister put her boot up on the stump to provide a sense of scale, as my first photo didn’t look very impressive. Since I don’t have my fungus guide here with me, I don’t know the identity of this individual, although it somewhat resembles an oversized and independent Turkey Tail. I will try to remember to update this with the actual ID when I get home and return to my field guide. There’s lots of different types of fungus in the forest here, some common ones I recognize, but lots I didn’t, and so I admired them but for the most part didn’t bother with photos. Fungus is one of those groups that I mostly don’t even try to ID strictly using the internet, preferring to look it up in a printed guide where you can quickly flip through photos. We returned to the house by way of the horses’ field, so that my sister could check their water trough level before we headed out for the afternoon. 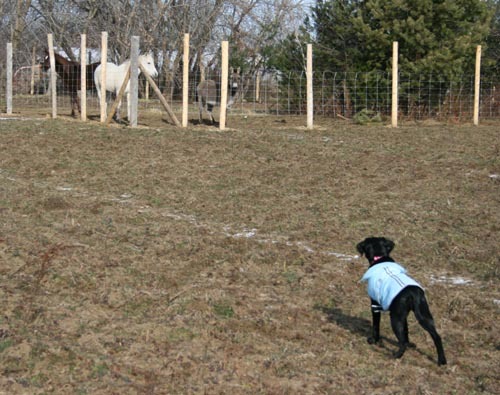 This was Raven’s first experience with horses (although she’d met the cows down the road from our house a few times, I think). I don’t think she knew what to make of them, or even whether to be afraid or curious or playful. The donkey made it clear that he wasn’t interested in playing, however (donkeys are often kept in herds of other animals like sheep because they are exceptionally bold and instinctively will drive off wolves or coyotes), and so we retreated back to the house to thaw out. Cai appreciated a jacket when he was a puppy, but doesn’t need one now. 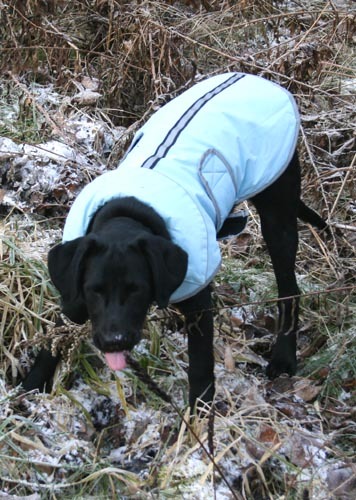 Raven’s coat looks well made for woodsy romps, and the powder blue and reflective stripe will certainly prevent any hunting accidents! Good to know that she might yet grow something warmer, Lavenderbay. In the meantime, this one does work well for her. I saw these lovely faux sheepskin ones that looked cozy and more attractive, but I rather suspect they’d be hard to clean after a roll in the dirt. Hee. Apparently I didn’t write that sentence very well, Horsin’around, I’ve had two comments correcting the artist of The Scream. I am aware that it was Edvard Munch, not Salvador Dali, who painted The Scream, but what I was trying to say was that the ice looked like The Scream if it had been painted by Dali rather than Munch. You know, Dali’s melting clocks? I linked to the separate works, but guess the writing was a bit confusing. I’ve edited the text to be clearer.